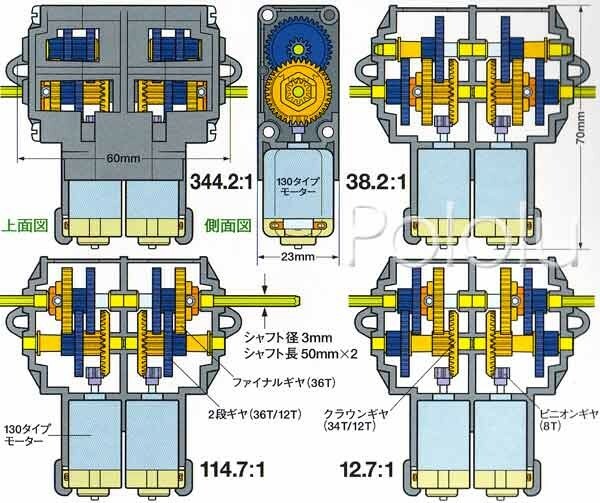 These parameters are calculated for the idle speed without taking into account losses in the gearbox. Manual showing how to choose gear ratio. A paper copy is attached to the kit. 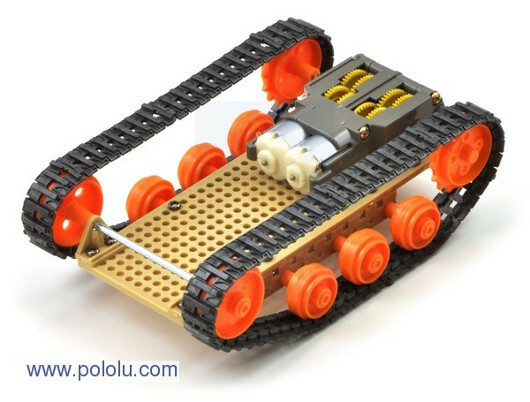 In our offer we also have accessories to help you build a complete robot moving on tracks or wheels traditional. 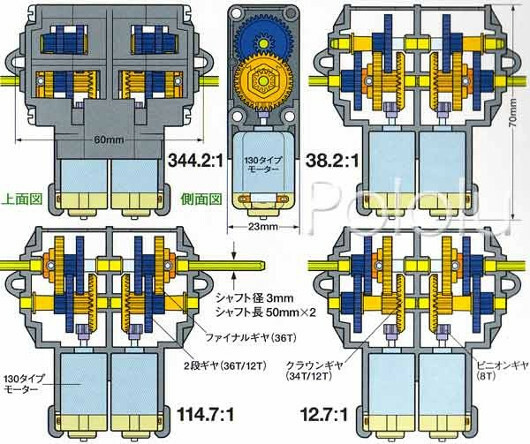 Gearbox works with other products of the company Tamiya, for example, a set of wheels, crawler and sport wheels. The tank is constructed from elements of the company Tamiya. For motor control, you can use available in our range modules series DRV8833 or the DRV8835. These systems allow you to power the motors supply voltage of 2.7 V, thereby the mechanical box will retain full viability. The user can also use the controller TB6612, limiting the motor voltage using PWM signal. Drivers can be monitored using sets of line (for example, Arduino, STM32Discovery or minikomputera Rasbperry Pi). In case of use of own printed circuit BOARDS, we invite you to see the range drivers in the form of chips in housings for soldering surface problems. Dual-channel driver for DC motors. Continuous current per channel 1.2 A (short, up to 1.5 A). Power from 2.0 to 11 V.
Popular module with AVR microcontroller Atmega32U4. Has 32 KB Flash memory, 2.5 KB RAM, 20 digital inputs/outputs, of which 7 can be used as PWM channels and 12 as analog inputs, as well as popular network interfaces, including USB.